Above: The finished product, 2 coats using MAC pigment in Silver Dusk. The pigment color in the jar intensifies quite a bit when converted into a polish. 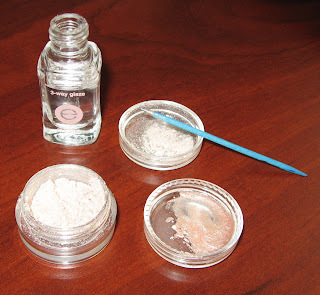 Below: The items needed to make a quick one-time use pigment polish: Something to mix in (I use a pigment cap), a clear polish (I usually grab something I don't use on a regular basis), a toothpick, eye shadow pigment. Many of us mix our own nail polish (commonly referred to as 'frankening') as a means of creating that perfect color we're searching for or to duplicate a sought-after color we're unable to get our hands on, for one reason or another. Or perhaps we just do it because it appeals to our curious and creative side and it's just plain fun! I am certainly guilty of this little past time, but if I don't want to go through the hassle of mixing polishes, making a bit of a mess, getting all the necessary items out (mixing balls, bottles, several shades of polish, etc. 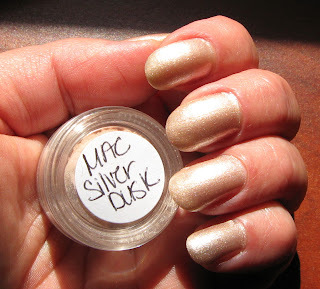 ), I like to resort to using eye shadow pigments with clear polish. The main reason I like to do this, is honestly, I don't need more bottles of nail polish. Also, I don't necessarily want to use up polish that I have a 'like' for to end up, after experimenting, with a polish that is, well, not at all something I'd wear! When I'm in the mood, I love mixing polishes. It's really fun and rewarding when you hit the color ratio just right, but if your time is limited and you don't have spare bottles, or you have a pigment color that you don't use for whatever reason, turn it into a bit of polish. This makes just enough to do my nails with 2-3 coats. If I don't like it, I haven't spent too much time or product mixing it. If I love it, then I may make more and fill a bottle with it. I usually just use a cap (see picture) to mix in, a toothpick, some clear polish and the pigments. I sprinkle the pigment in the cap, add approximately 20 drops of clear polish, then mix it up with the toothpick, getting all of the pigment into the polish until it's smooth. Sprinkle just a bit of pigment in for starters, then add more to the clear drops until you get the consistency of a standard polish. Try mixing a couple of pigment colors together for a unique look, or add a drop or two of a colored polish into the mix.